Background: Minimally invasive surgery is still considered controversial by many in terms of oncological clearance. This may be true due to the long learning curve in minimally access surgery. We postulate that minimally invasive esophagectomy is equally effective, if not better, in terms of radicality and oncological clearance at hands of a well experienced minimally invasive surgeon. Methods: 67 cases underwent esophagectomy in our institute from June 2006 to March 2009. Of the 67 cases 22 were laparoscopic transhiatal esophagectomies and the rest 45 were thoracolaparoscopic esophagectomies . 48 cases were squamous cell carcinoma and 19 was adenocarcinoma. 38 were lower esophageal tumors and 29 cases were those in the mediastinum. In the thoracolaparoscopic arm a 2 field lymph node dissection of the abdomen and the mediastinum was done. In the transhiatal arm abdominal field dissection and mediastinal periesophageal nodes and subcarinal nodal dissection was done. Results: Mean number of lymph nodes retrieved were 19. Range was from 10 to 33. In the transhiatal group the mean number of LN retrieved were 14 with a range of 10 to 21. In the thoracolaparoscopic group the mean numbers of lymph nodes retrieved were 22 with a range from 13 to 33. 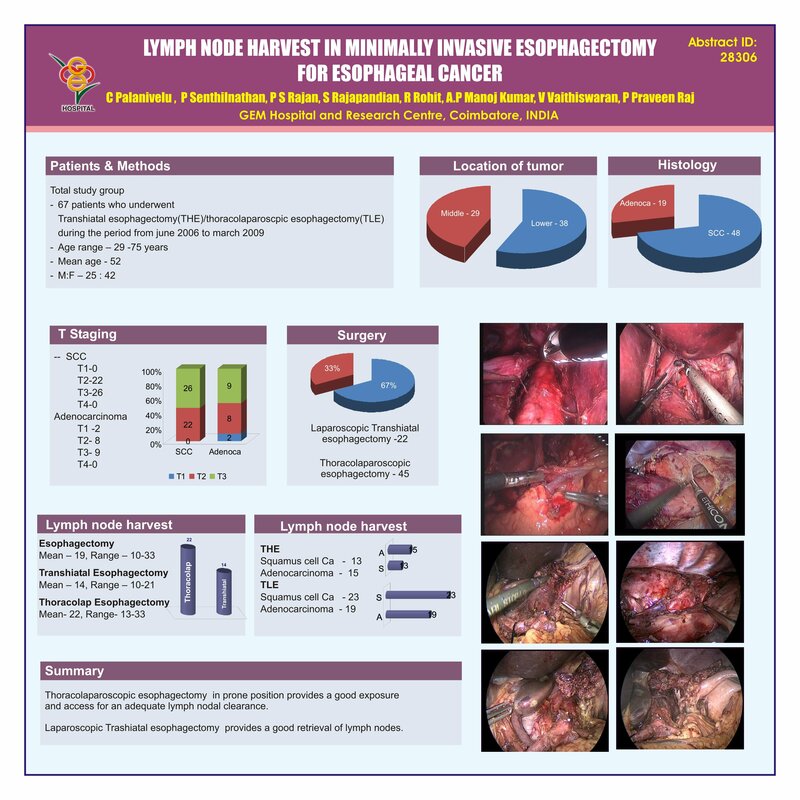 Conclusion: In terms of adequate tumor clearance and radical 2 field lymph node dissection, minimally invasive thoracolaparoscopic esophagectomy is an accepted procedure in hands of well experienced minimally invasive surgeon. It also offers an added advantage of having a better morbidity and mortality profile as considered to open transthorasic esophagectomy.